Toddler Approved! : Better Hearing & Speech Month Giveaway! Better Hearing & Speech Month Giveaway! In honor of Better Hearing & Speech Month, we're hosting a giveaway... featuring two of my favorite resources to use with children (at home or at school) to help foster communication! What's in the Cat's Hat? Game- This is a seriously fun game... while helping improve memory & deductive reasoning skills at the same time. It also provides opportunities for answering and asking questions and developing sensory skills. 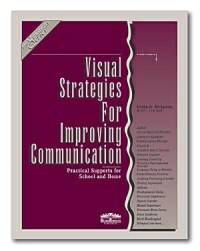 Visual Strategies for Improving Communication by Linda Hodgdon - This is an awesome resource for anyone who wants to improve their communication with children... especially those children with learning, sensory, or processing difficulties. I use the strategies all the time at home with my son (and his friends)... and I even use the strategies when I am teaching my teenage students at church. This book doesn't just present information, but also shares many many examples to help demonstrate the strategies... which benefit all kids, not just kids with communication difficulties. So... how can you win? Giveaway Entries: For your chance to win these prizes, leave a comment on this post by Wednesday May 25th at midnight. Please include an email address and why you would love to win this giveaway. I'll announce the winner chosen from random on Thursday morning, May 26th. Good luck!! - Go to the American Speech-Hearing-Language Association's BSHM website and check out some of the Public Resources. Leave a comment stating something new you learned about communication disorders, hearing loss, or general hearing & speech. - Like Toddler Approved on Facebook. - Share this giveaway on your blog or Facebook page and link to the giveaway or the Toddler Approved Facebook page. - We'll also give an extra entry to the first and last people to comment! Thanks for the recommendations & chance to win. this seems like so much fun! and my kiddies would love it. One of my friends is a speech therapist and she always has such great suggestions on communicating with kids. I'd love to look at that book and of course the game sounds like a ton of fun. Thanks for the chance to win. Already a fan on facebook :) I'll post this on my Full to the Brim giveaway list later today. I would love to win because the game looks like fun for the whole family. I would love to win this for my 3.5 year old son. He is autistic, and so communication is difficult for him. Any tools to help him learn and grow are always appreciated! What a fun giveaway, thanks for a chance to win. would love this for my kids to enjoy! Thanks for sharing both of these great resources. 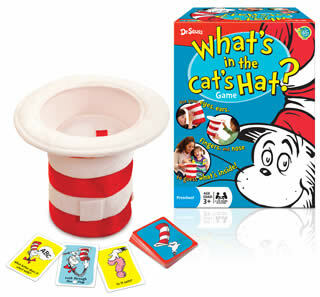 I would definitely play the Cat in the Hat game at home with my 2 year old. I'm also very curious about the strategies used in the book. I'm sure I could implement them at home with him and also share the book with my fellow teachers - seems like a great tool for any inclusion program. I have 3 young kids and would love to win this. It would be a fun and educational way to teach my kids. Thanks for the opportunity to win! My sister would love this for her son! Thank you! I'd love to be entered to win this! My oldest is almost 3 and has always had some trouble/been slow to communicate. We're working on it, but we definitely still have our bad days. I learned that not following directions can be a sign of hearing loss. It makes a lot of sense now, but I'd never really thought about it like that before.